Yamaha XF, XS, MOXF, MOX, S70/S90 XS or Rack-XS! You may know KARMA from the fact that it's been an important feature of many Korg high-end workstations, such as the Kronos, OASYS, M3 and original Karma Workstation. 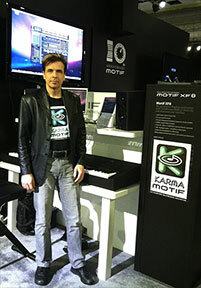 KARMA Developer Stephen Kay has now made it possible for Yamaha owners with a Motif XF, XS, MOXF, MOX, S70/S90 XS or Rack-XS to have an even more advanced version (v 3.3) of the same KARMA technology with the new release of KARMA Motif Software. Running on your PC (Mac/Windows), KARMA Motif provides you with all of the inspirational and interactive KARMA features of Korg's flagship workstations and then some - at a fraction of the cost. The only difference is that the KARMA engine is provided by the computer, not built-in to the keyboard. Yet it feels "built-in" since KARMA sends parameters and text information directly to the keyboard's Remote Mode display so that you can operate the software without even looking at the computer. KARMA Motif uses the Song/Mixing/Multi Mode of the Motif-based instruments to provide 16 part multi-timbral templates with the kind of fully interactive real-time controlled grooves that only KARMA can produce. "Finally, the new KARMA Motif 3.3 Release is here, and the release of our first Xpansion Pack of 32 additional KARMA Performances! KMo continues to support six Yamaha models: the XF, XS, MOX, MOXF, S70/S90 XS and Rack-XS). And they all sound and work virtually identical and equally amazing (if I can say so myself). The software runs on all current Mac OS X versions, from 10.5.8 through Sierra 10.12, and all Windows versions from XP through Windows 10. I'm confident you'll find KARMA Motif to be an exciting program that will add a whole new dimension to the enjoyment and use of your Yamaha instrument." Supports six different Yamaha instruments: Motif XF, Motif XS, MOXF, MOX, S70/S90 XS and Motif-Rack XS. can be used for powerful and inspirational real-time control of your grooves. Yamaha iPad apps can be easily integrated for further control. Generate unique musical effects in real-time including: full-blown backing tracks, techno arpeggios & effects; dynamic drum/bass/synth grooves; dense rhythmic & melodic textures; natural sounding glissandos; guitar strumming and finger-picking; random effects; auto-accompaniment effects; gliding portamento and pitch bend effects. Includes 491 Generated Effects (GEs, the individual phrase patterns) and 64 Performances using the instrument's Song/Mixing/Multi mode, where each of the 64 songs is a complete, 16 part multi-track KARMA algorithmic music groove. Each Performance features six KARMA Modules, with a left hand and right hand zone for controlling KARMA and soloing on top of it, and eight fully voiced and completely different scenes. The instrument's arps are also integrated in each Performance as additional elements that can be triggered via the Intelligent Chord Trigger Transposition features. And since you are already in Song Mode, you're just one step away from recording your KARMA-fied musical performances into the internal sequencer - or you can route the output to any DAW for external sequencing. Furthermore, a KARMA Performance can call up any Voice, Performance, Song, Pattern, or Master slot when loading, so that KARMA can be used in any of the instrument's modes. Access 400+ KARMA GE parameters for impressive musical results. Graphical editing and creation of Drum Patterns, Rhythm Patterns, Duration Patterns, Index Patterns, Cluster Patterns, Velocity Patterns, CC Patterns, Wave-Sequence Patterns, Envelopes, Note Maps, and more! Create new GEs, and edit existing GEs into new configurations. Import phrases and drum grooves exported from the internal sequencer, or from any .MID source (such as external sequencers) and transform them into KARMA GEs. Automatically assign GE Parameters and RTC Models and instantly begin varying your phrase in the amazingly interactive KARMA manner. Captivating, real-time visual display of the generated MIDI data. Popup tooltips and context-sensitive Help provide comprehensive documentation of all features. Available for both Mac OS X and Windows platforms. See Minimum System Requirements. 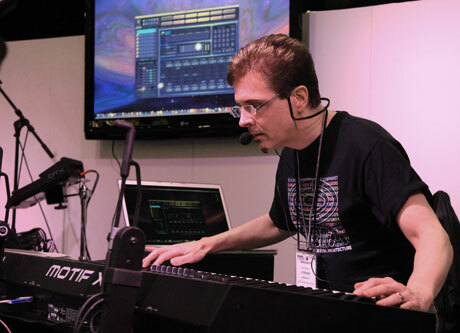 See/hear musical performances, demos, guided tours, tutorials and more, on KARMA-related keyboard products including the Korg Kronos, M3, OASYS, and Karma, and the Yamaha Motif XF and Motif series. "KARMA Motif is a great addition to the MOXF and is well-suited for film and TV work as well as experimental songwriting - not to mention a very fun way to create mesmerizing solo performances. It's transformative, addictive to use, and adds major firepower to supported Yamaha workstations."  Why is KARMA different from an arranger keyboard, or an algorithmic composer?  What is KARMA Motif? It's Karma-Lab's newest third generation KARMA 3 technology, in a standalone PC/Mac software program exlusively designed for a group of Yamaha instruments (Motif XF, XS, MOXF, MOX, S70/S90 XS and Rack-XS). It's an even more-advanced version of the same KARMA Technology that is built into Korg's award-winning Kronos, M3, and Oasys Workstation keyboards. By utilizing your computer and the software, connected to your Yamaha instruments via Yamaha's USB or FW Driver, you can effectively "add KARMA to your Yamaha", turning it into a unique, fully interactive real-time controlled groove machine unlike anything else!  Does it somehow install "into" the Yamaha instrument? No, it cannot be installed directly into the device. It runs on your computer, and communicates with your Motif-based instrument via MIDI through Yamaha's USB or FireWire driver (or even a standard MIDI Interface, although this is not recommended). There are no modifications to the instrument (other than loading our data files containing voices and songs/multis) or the instrument's OS (operating system). However, when using KARMA Motif with your keyboard's Remote Mode controlling the software, a "Real-Time Information Stream" of parameters and text and values is sent from the software directly to the screen of the keyboard, allowing you to control the software without looking at the computer and making it feel as if the software is actually inside the keyboard. Examples of this powerful feature can be found here: XF and XS • MOXF and MOX.  How do I use KARMA Motif? Using KARMA Motif is similar to using the on-board arpeggiators of the Yamaha instrument, except far more advanced and versatile. 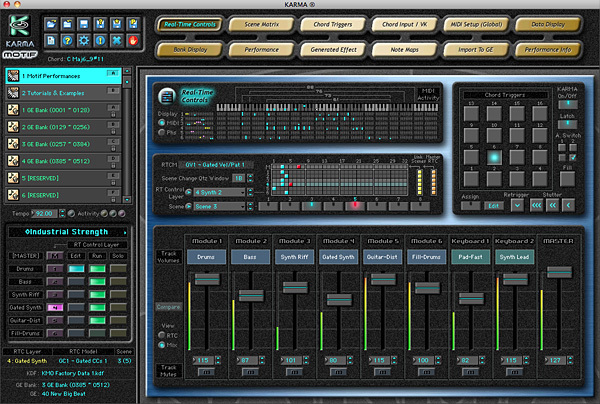 KARMA has hundreds of parameters that can be varied in real-time, either from the on screen sliders and switches in the "Realtime Controls Editor," or via knobs, sliders and switches from an external control device, such as the Steinberg CMC-QC or CMC-PD, the Novation Remote 25, the Korg Nano series, etc. You can jam with it, use it for inspiration to spark new song ideas, use it generate individual bass lines, synth parts, drum grooves etc. for your own tracks - it's almost like a loop collection that never gets stale, since the movement of a single knob or slider can give you a whole new loop. And it's easy to store your own variations and patterns in additional banks within the software - you can even import simple MIDI phrases and have them instantly turned into KARMA Generated Effects (GEs) that go far beyond the capabilities of the original phrases.  How many Performances and Generated Effects does it come with (and are there more)? (we plan at least another two sets and have another 54 Performances in various stages of completion at the time this was last updated.) You can find out whne they are released on the KARMA Motif Sounds Page.  Can I record the results of the KARMA generation? Yes, the impressive results generated by KARMA Motif can be recorded either as audio or as MIDI data. We tried to make it particularly easy to record a KARMA Performance into your Yamaha instrument's internal sequencer. You can record a single Control Track with all of the button pushes, keyboard licks, controller moves, etc., such that playing it back completely recreates the Performance. Then, you can dump the output of that to separate MIDI tracks. Or, you could record the final results directly to audio tracks in an external DAW or recording device. Secondly, the MIDI data generated by KARMA Motif can be recorded into external software sequencers such as Sonar, DP, Logic, and Cubase (using Virtual Interapplication Ports). You can then route the output of KARMA directly into your software-based sequencing program - the MIDI data can then be played back, edited, overdubbed etc. and become part of your project, while you use KARMA Motif to generate other parts. We have detailed tutorials on "Sequencing with KARMA Motif" that can be viewed (with other tutorials) on the KARMA Motif Documentation page.  Can I use KARMA Motif with other synths and soft synths? Yes, but only if you actually have one of the supported Yamaha models connected to the software. The XF, XS, MOXF, MOX, S70/S90 XS or Rack-XS must be located on the global port settings. Then, you can send the algorithmic effects being generated by KARMA to any device that is part of your MIDI setup. By using KMo's Virtual Ports, you can also control many soft synths and audio generating programs such as Reason, plug-ins inside your favorite DAW, etc. are there different versions that I can use with other keyboards? Yes! Please visit the KARMA Software page. There are also versions for the Korg M3, Korg M50, Korg OASYS, Korg Kronos, as well as legacy versions for the Korg Triton and Korg Karma.  Is there a demo version I can try out? Not at the moment, but we may produce one in the future.  Can I look at the manual, documentation and tutorials before I buy it? Yes, by going to the KARMA Motif Documentation page.  Where can I purchase KARMA Motif, and how much does it cost? You can purchase KARMA Motif directly from us at the Karma-Lab Store: BUY KARMA MOTIF. Please check the store for the current price and any special promotional offers. The software is sold as a downloadable electronic version only (international customers) or your choice of a downloadable or physical CD package (USA only).  Is the software copy-protected?  Can I install the software on more than one computer? Yes - The license allows the software to be installed and authorized on two computers owned and operated by a single user (i.e. a desktop and a laptop), provided only one is in use at a given time. If you require more than the two authorizations provided for, we will be happy to work with you to arrive at a solution.  When I order the software, it asks me to choose an Operating System - does this lock me into a single OS? No - the OS selection option on the store page serves two purposes: 1) to let us know what the user's main OS is, and 2) to make sure that the user is aware of which operating systems are actually available. Once you have ordered and are sent to the download page, you can download whichever OS you want from the full list of available operating system installers. If you choose to order the CD-ROM option (USA only), all of the installers for all operating systems are included on the CD.  When I order the download option, how quickly is it delivered? The download link for the software package will be sent to you as soon as a human reads the order. This can be within an hour, or sometimes not until the next day - it all depends what time it is and where you are in the world. We are a small company and do not (yet) have automated delivery methods. But we do check the orders all day (7 days a week), not just normal working hours, so you will get it in most cases within a few hours.  Where can I get some more information or ask questions? The Karma-Lab KARMA Motif Forum is a good place to find out about KARMA Motif and the supported Yamaha instruments. Ask a question in the KARMA Motif Software section. You can also send an e-mail to: info@karma-lab.com.